Michel Roux, the three-Michelin-starred chef and owner of the Waterside Inn in Berkshire, and his chef patron son Alain Roux, are to create the menu for the Panoramic restaurant at Royal Ascot 2010, it has been announced. The father and son team will serve guests of “The Waterside Inn at the Panoramic” a menu of French cuisine with “a modern touch” devised especially for the Royal Meeting. 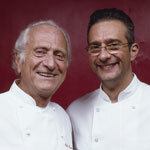 Michel Roux OBE, said he has been a visitor to Royal Ascot ever since he took the helm of the Waterside Inn in 1972. “I am therefore very happy that the Waterside Inn will be at the Panoramic Restaurant and proud to have my son Alain with me, along with our general manager Diego Masciaga. The Panoramic restaurant will run using teams from both the restaurant and the racecourse. The Michel and Alain Roux menu is available for lunch during Royal Ascot week from 15 June until 19 June. Dishes will include cold tomato gazpacho garnished with basil-flavoured mozzarella cannelloni; sauté of lamb and roasted best end served with a saffron-flavoured celeriac and seasonal vegetables; pistachio-flavoured crème-brulèe with vanilla ice-cream; and a trio of British and French cheeses with a fig and walnut bread.